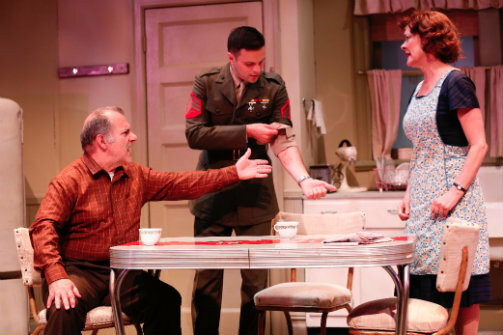 Joe Lisi, Jonny Orsini, and Karen Ziemba in Almost Home. Photo by Carol Rosegg. BOTTOM LINE: A Vietnam-era drama that leaves a lot unresolved. They say write what you know. In the case of Walter Anderson, that might not have been the best advice. The publisher and editor-in-chief of Parade Magazine is a former Marine sergeant and Vietnam veteran and he may have been too close to the material—of a young soldier deciding what to do after the war—to create a cohesive play. It's clear that Anderson has stories to tell that are worth telling, but this one needs a few more edits. Usually 80 minutes with no intermission is an ideal length for a show, but in this case, Anderson sets up more that can be resolved in that amount of time. In the first scene, which takes place in 1958, Harry Barnett (Joe Lisi) is arrested for drunk driving and a cop named Pappas (James McCaffrey) decides to let him off the hook when he finds out that he is a World War II veteran. The next scene is in December, 1965 at Harry's home in the Bronx, where he and his wife Grace (Karen Ziemba) are waiting for their son Johnny (Jonny Orsini) to return home from Vietnam after an injury. Johnny announces that he was asked to be a drill instructor, but he wants to go to college in California. Pappas stops by to let him know that Harry owes a lot of money and Pappas will only bail him out if Johnny joins the police force. Meanwhile, Johnny and his father, who deals with his problems by drinking them away, have trouble letting go of their memories of war. See, there's a lot going on. Orsini plays period well, as he did in the 2013 Broadway play The Nance (that one took place in the 1930s). Brenda Pressley's character Luisa Jones, their neighbor and Johnny's former teacher, is the most intriguing, but a key moment set up as important is never brought up again. Even veteran actors like Ziemba struggle to make three-dimensional characters and director Michael Parva doesn't do much to help them. On the plus side, Harry Feiner's set grounds the audience in the setting of a run-down home in the sixties. A nice touch is the radio playing songs of the era by artists like Elvis, complete with commercials.